This is a historical page. Click here for information about this year’s Astronomy at the Beach. 2017 brings some big changes for Astronomy at the Beach! 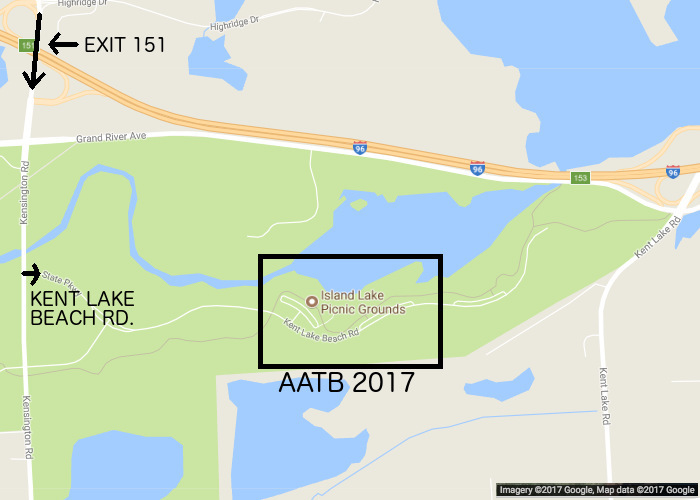 The Great Lakes Association of Astronomy Clubs (GLAAC) is partnering with the Michigan Department of Natural Resources this year to bring the event to the Kent Lake area of Island Lake State Recreation Area. The event will be September 29 & 30, from 6:00 pm to midnight, rain or shine, both nights. Outdoor astronomy activities demand clear skies, but there’s plenty to do in the tent and park building as well. RSVP on our Facebook event, and invite your friends and family! If you’d like a printable flyer to post or hand out, download it here! Just across I-96 from our previous location! What happens at Astronomy at the Beach? 6:00 to Sunset: View sunspots, prominences, and other features of the sun through safe white-light and incredible hydrogen-alpha solar telescopes. 7:00 PM: Learn about the celestial visitors we call comets. Watch a “comet” be made from dry ice and common household ingredients. Very family friendly. 7:30 PM: Oh What a Spin We’re In! From galaxies to planets to tornadoes, there’s a lot of spinning going on out there. Find out more about the space environment with liquid nitrogen and everyday common objects, participate in some angular momentum demonstrations, and watch a “fire tornado” come to life! 8:00: Losing the Dark: Why can’t you see many stars from your neighborhood? Learn about how light pollution is making it harder to see stars and other astronomical objects, and what you can do to help reverse the trend. 8:30 PM: 3D tour of the Solar System: Take a short 3D movie tour through our Solar System. This presentation uses the red-blue 3D glasses, please arrive a little early to get your glasses. 9:00 PM: Near-Earth Asteroids: Impacts and Exploration: What would happen if an asteroid, like the one that wiped out the dinosaurs, hit Earth? Dan Durda, one of the leading researchers in this field, will talk about these “Near-Earth Asteroids”, including past and potential impacts. All evening: there will be a Children’s Sky Tour Treasure Hunt. See one of every type of object for a prize! Stay late and observe dozens of celestial objects until midnight through the many telescopes provided by the GLAAC members. Many vendors will have various astronomy products, such as telescopes, binoculars, eyepieces, books and computer software on display and for purchase. Visit our member clubs and sponsors in the pavilion. Participate in hands-on demonstrations, make-and-take activities, find out which club is nearest to you, and learn more about our wonderful sponsors. There is no admission fee to attend but a recreation passport is required for park entry. If you didn’t purchase one when you renewed your vehicle registration, you can get a sticker at the gate. The event takes place at Kent Lake Beach inside Island Lake State Recreation Area. Visitors are encouraged to bring a reusable water bottle. Seating outside may be limited, so consider bringing chairs. People will be looking through telescopes, and the use of white light of any kind makes this difficult. Please be considerate: use only flashlights with red filters and don’t use a flash when taking photos outside. The night sky isn’t as dark as it used to be. It is harder to see stars, galaxies and nebulae; Turtles, birds, bats and insects that travel at night are getting lost; people are developing more sleep disorders. Find out why. Dr. Dan Durda is a Principal Scientist in the Department of Space Studies of the Southwest Research Institute’s Boulder Colorado office. He has more than twenty years of experience researching the collisional and dynamical evolution of main-belt and near-Earth asteroids, Vulcanoids, Kuiper belt comets, and interplanetary dust. He is an active pilot, with time logged in over a dozen types of aircraft including the F/A-18 Hornet and the F-104 Starfighter, and was a finalist in the 2004 NASA astronaut selection. He serves as a flight astronomer for the SWUIS-A airborne astronomical imaging system flown aboard NASA and military high-performance, high-altitude aircraft and has spent over 110 minutes of time in zero-gravity conducting experiments on NASA’s KC-135 Reduced Gravity Research Aircraft. Durda is one of three SwRI payload specialists who will fly on multiple suborbital spaceflights with commercial suborbital companies. Dan Durda is a Fellow and a former member of the Board of Trustees of the International Association of Astronomical Artists. His space art has appeared in numerous magazines, web news stories, and books and has been internationally exhibited. He has co-authored a book and published dozens of articles popularizing planetary science and human exploration of space. Dan is an experienced cave diver and holds multiple scuba and cave diving certifications, including Full Cave and Cave Recovery Specialist. He enjoys hiking in the wilderness of the Rocky Mountains, photography, birding, and paleontology. He is a National Rifle Association Basic Pistol Instructor and has extensive training in tactical pistol and rifle.